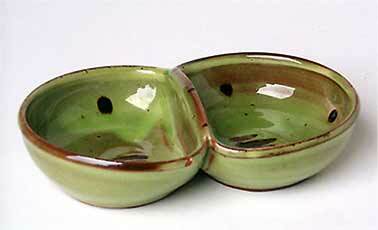 Sid Tustin double pot - 6¼" (158 mm) long, 3¾" (95 mm) wide. 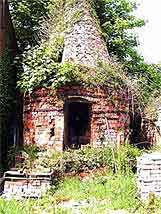 When Sidney Tustin joined Michael Cardew at Winchcombe Pottery in 1927 he was thirteen years old. He could not have wished for better teachers; Cardew, fresh from his own learning experience at Leach Pottery, and Elijah Comfort, the former chief thrower at Beckett's Pottery, the former occupiers of the premises where Winchcombe had been set up. His work, of course, was menial at first. He would turn the wheel for Comfort - a man for whom he had great admiration. But after a couple of years, when proper production had actually started, Cardew invested in a powered wheel for Comfort, leaving young Sidney free to start throwing. Sidney kept on throwing for fifty-one years, never leaving Winchcombe Pottery except for war service. He retired in 1978 having made over a million pots. His work is of excellent quality, and he must be considered the backbone, and certainly a star, of Winchcombe Pottery.